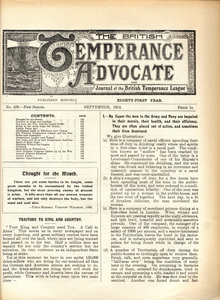 British National Temperance League, University of Central Lancashire (1914) The British Temperance Advocate, September 1914: Cover. The British Temperance Advocate and Journal of the British Temperance league, 1914 (429). p. 1. 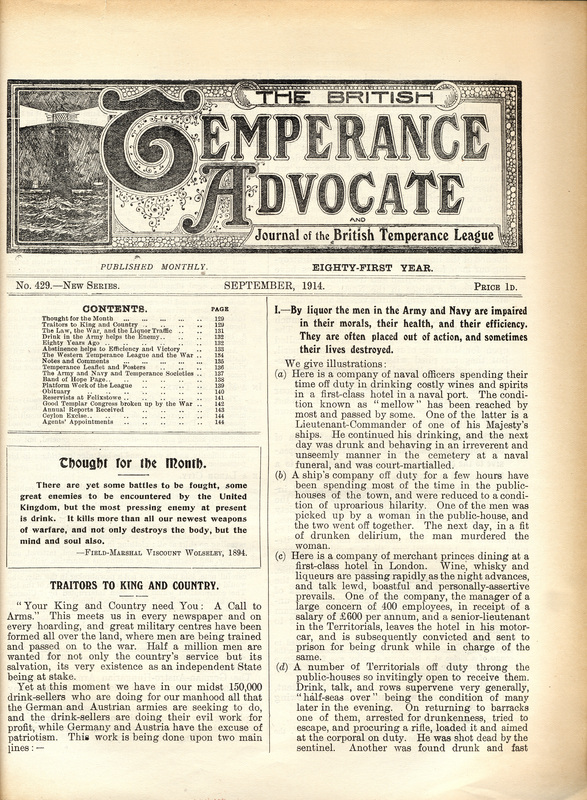 War time edition of The British Temperance Advocate and Journal of the British Temperance League. Traitors to king and Country - negative impact of liquor and liquor sellers on the war effort. "There are yet some battles to be fought, some great enemies to be encountered by the United kingdom, but the most pressing enemy at present is drink. it kills more than all our newest weapons of warfare, and not only destroys the body, but the mind and soul also"